So, you have packed your bags for that dream vacation? You may have planned the trip to the last detail so that nothing could go wrong. An experienced traveler, however, would tell you that even the best plans are subjected to change and can go haywire. What happens if your luggage goes missing or if a valuable item is stolen? It has all the elements to ruin our trip. How to travel safe? 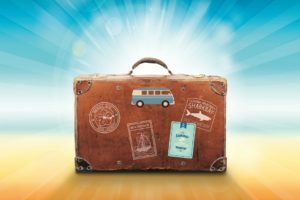 When planning a trip, you have to take into consideration all the potential expected and unexpected difficult situations that you might encounter while traveling. Baggage theft is one such situation, which might even turn into a frightening experience. Before stepping out of the house, make sure to check all the zips and the locks on the luggage. All the valuable items should be properly packed so that thieves don’t get an idea that the bags contain something worth stealing. Let’s take a look at how you can keep your luggage and valuable items, especially official documents if you are going on a business trip, safe while traveling. In nutshell, how to travel safe? Invest in tamper-proof, high-security locks if you want to deter the criminals from targeting your luggage and belongings. They don’t prefer to steal things from luggage that takes time to open. It is too much of a hassle, and criminals fear that they would get caught if they spend more than a few seconds on breaking a lock. In case you are traveling within or from the U.S. or Canada, it is best to use TSA, or Transportation Security Administration, approved locks. TSA can open and physically inspect your checked luggage, to ensure that you are not carrying any prohibited items. And, without any prior warning, TSA officials can use force to break open the locks on your bags. Thieves can easily rummage through the luggage if its locks are broken or damaged. TSA-approved locks are master key locks that have “Travel Sentry” or “Safe Skies” logo on them. TSA officials have master keys for such locks, which eliminates the need to break the lock. Instead of picking a fabric travel case, it is better to travel with hard case luggage that features clasps and not zippers. Using a cheap ballpoint pen or a knife, a thief can quickly open the fabric travel case that has a zipper. It is far harder to tamper with hard case luggage, and thieves don’t target bags that are harder to get into. And if you like bags with zippers, go for the ones that have double zippers at entry points so that you can secure the bags with combination locks. Never lose sight of your luggage or leave it unattended. It is best to keep your luggage and belongings close to you while traveling. If you want to travel safe, you have to secure your luggage against possible theft.You cannot have a chilled out and stress-free vacation if a thief disappears with your luggage or yourvaluable items. Moreover, before leaving for your vacation, you must also secure your home against potential intruders. You don’t want to return from the trip to discover that your house has been burglarized. Consult a professional locksmith to find out how to keep yourhome safe while you’re traveling.